Are you a sales manager or responsible for managing your company’s field service? Do you want to gain effective and efficient oversight of your team? Do you want to know at any given time what’s happening outside in the field? With a portatour® Company Account, you get a professional sales oversight tool and can thus implement your sales strategy consistently. As management, you define the goals of sales calls, create guidelines for the structure and scope of call reports, and determine the rules for accessing customer data. Read on to find out more on how to reach your goals with a portatour® Route Planner Company Account. A portatour® Company Account provides the easy and convenient administration of your field service staff. You create new users and determine who has what rights. You set the field service requirements: customer stock, call frequencies, duration of customer calls, working hours, etc. When a new employee starts in the company, they are ready to go immediately. If an employee leaves the company, just switch off their access with one click and transfer the territory to a different employee. All of these features are presented in this article. A switch from the single-user version to an Company Account is possible at any time. Find out how at the end of the article. In order to achieve sales goals, targets must be defined: which customers should be visited how often? How long should customer calls ideally take? What information should be included in the call report? What are the working hours and breaks? Do you want to automatically schedule overnight stays? Without these targets, management goals are not met. You define the general framework for your sales force centrally and specify the rules of the game. Deviations from the company-wide settings can also be set individually for each user. This also gives you the flexibility you need when territories are differently dimensioned . 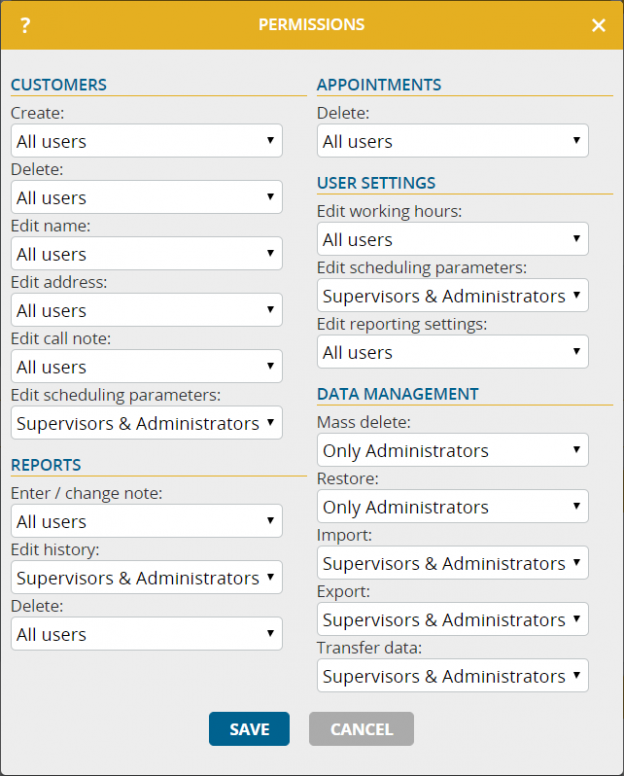 Traditionally, these settings are configured by your sales manager and IT/CRM management. The portatour® Team supports you by means of a setup workshop. So you also benefit from our experience of over 1,000 rollouts, and your system is optimally configured within 2 hours. You are familiar with the scenario: a new colleague starts at the company. Another colleague leaves the company. This is often associated with a great deal of effort on the part of the IT department. Not so with portatour®: with an Company Account, you administer system access yourself with just a few clicks and within seconds. New users are easily created. Existing users can be disabled quickly when an employee leaves the company or loses his or her mobile device. 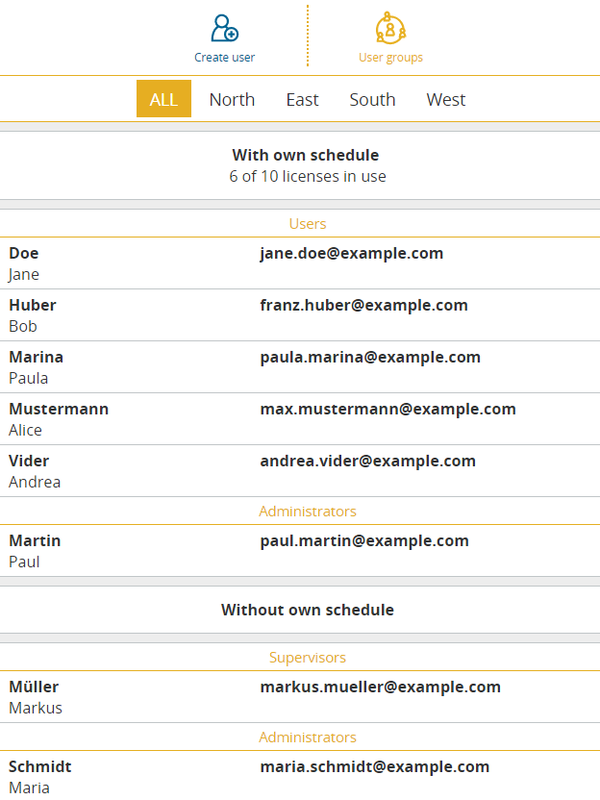 It is also possible to automatically manage users by means of bulk operations through the portatour® API. For example, 100 users or more can be created or updated in a single operation. This makes the administration of large field service teams far easier. Thanks to central user administration, you are the master of your system and do not waste any valuable time. Once a colleague leaves the company, their territory is simply taken over by a new colleague, together with the complete customer history of their predecessor. No data is lost. Do you have several people occupied with the management of field sales? Do they support your field service? Then we have good news for you: management, back office and administrator accounts are completely free of charge with portatour®! Using their own accounts, area management knows what’s happening out in the field. Cooperation between office and field is far easier if both use the same software. Do you have a large field service team? Does one area manager support an entire team in the field? Do you want each area manager to have access only to their own team? With portatour® user groups, you divide your salespeople and managers into appropriate groups. The area manager and the back office staff only see the data that is relevant to them. portatour® also takes these rules into consideration for reporting (e.g. the application check) – so you can optimize your internal reporting process at the same time. Note: User groups are available as of 10 user licenses. In the permissions management, you determine which type of user is allowed to perform which functions in portatour® or which authorization level is necessary to make certain changes to data – e.g. who can create customers and if reports are allowed to be changed after they have been entered, and so on. The field service clearly benefits from high-quality and up-to-date customer data. For this reason, customer data has traditionally been stored centrally by companies in a CRM or ERP system. Regardless of where your customer data is managed, simply upload it for each field representative using the portatour® data import function. You can also export data centrally from portatour® in order to re-synchronize it with your CRM/ERP System. Different file formats (Excel, CSV, ODS) are supported in both directions. Do you want to automatically synchronize your customer data daily or weekly with your CRM/ERP system? Then the portatour® API is just the solution for you. Without automatic synchronization, your IT department would have to manually update the data regularly. This would generate recurring effort, increase the potential for mistakes and could lead to data corruption. It is therefore advisable to automate the IT processes via the API. Implement the API once and you never have to worry about data synchronization. We are happy to support the implementation with an API workshop. For territory restructuring, staff increases or vacation coverage, it is often necessary that customers be transferred to another colleague, whether permanently or only temporarily. This is very easy in portatour®. 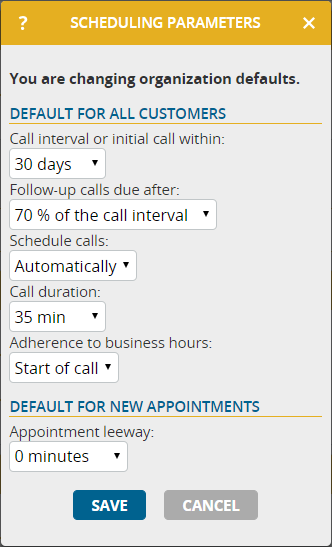 With just a few clicks, you transfer customers, appointments and report data between representatives. As a result, you gain flexibility in data management and are responsive if a colleague is temporarily unavailable or you increase the size of your team. 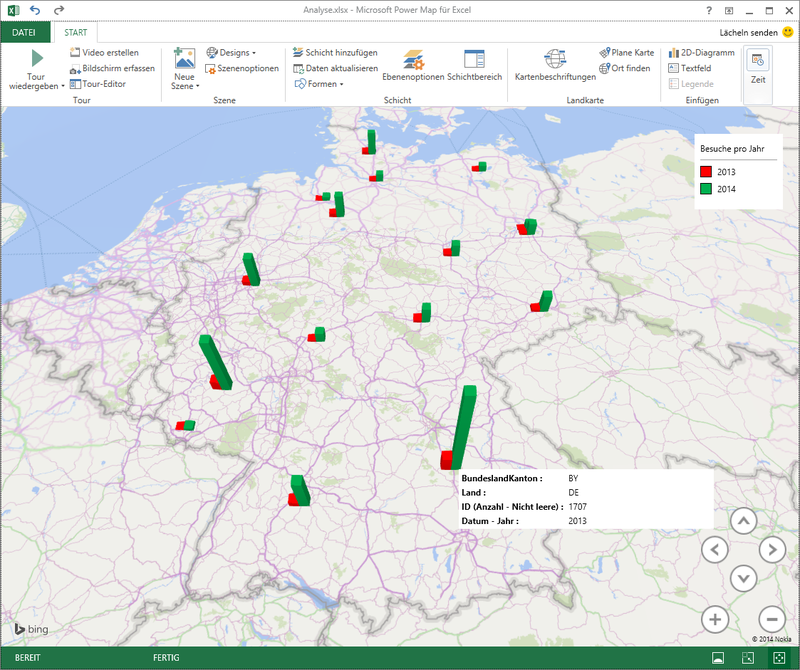 Do you want an overview of your data quality and the use of portatour®? Do you want to know if portatour® is configured correctly? Do you want to see if a colleague has problems with the software but is too shy to ask for help? With the Application Check, you perform a “full physical” and get an overview of the health status of your portatour® Company Account. 35 criteria regarding data quality, scheduling parameters, territory characteristics and usage information are reviewed and made available to you in a compact report. From the Application Check, you make important management decisions based on hard data and keep an eye on your sales strategy. You also receive helpful hints about possible improvements and identify early on whether there is a need for employee training. Many companies use the Application Check as a monitoring tool during a pilot project or as a basis for continuous improvement of the field service organization during ongoing operations. The portatour® Report summarizes the most important key figures for sales activity in a sales territory. You can get it at the push of a button or have it sent daily and/or weekly via e-mail. Some companies, however, have very special requirements for reporting and want to link the sales data to other company data. The standard portatour® Report does not cover these requirements on its own. How do you get your Company Account? The portatour® company functions are included at no additional cost when you purchase two or more licenses. A transition from the single-user version to an Company Account is possible at any time. To increase your licenses, simply send an email to sales@portatour.com or in the Options, click “Upgrade to Company Account” directly from within portatour®. If you do not yet have access to portatour® simply visit our online shop and order licenses for 2 or more sales representatives. Click here to visit the shop. We wish your company much success on optimized routes with the portatour® Route Planner.